Excitebots: Trick Racing is one of the best racers in the last decade. I purchased Excitebots: Trick Racing on an impulse for $4.49. Once I was home I put the disc in my WiiU and quickly realized this was easily worth full retail price. Excitebots contains all of the best elements of other games such as Mario Kart, Need for Speed, Beetle Adventure Racing, SSX, and even Populous(I'll get to that later on). There are colorful, vivid tracks, a variety of weapons, intense arcade racing, insane jumps and midair tricks. Another interesting feature is the minigames that can be completed during the race to increase the number of stars you earn. The stars are currency to unlock extra vehicles and colors. You can wager them against online opponents or even send them as rewards for accomplishing challenges sent to other players online. Graphically, Excitebots is vibrant and fast. There is an abundance of vegetation and excellent water effects. It's fun to dash through shallow water and watch the spray. The frame rate never drops, even in versus or online racing. The sense of scale and dizzying heights during some of the jumps can give you the same feeling as standing on the edge of a tall building or structure. 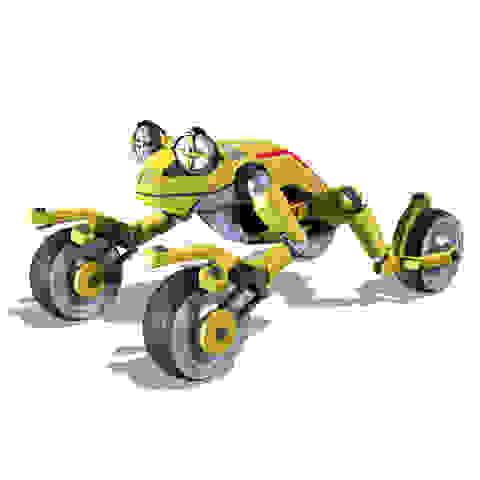 The Excitebots are very well designed and have great animations. They range from ladybugs to giant turtles and a multitude of color choices(many of which must be purchased). One exceptionally minor drawback is the anti-aliasing that is typical of Wii hardware. It's not bad, but it is noticeable. The sound effects are crisp and well crafted. The way the volume drops out and sounds like you're rushing through a tunnel during high jumps enhances the effect of height and speed as you rocket toward the ground. The music, on the other hand, is very generic. There isn't any memorable music to be found, but it serves it's purpose and is only a minor negative to the overall experience. The Wiimote's gyroscope and accelerometer are put to excellent use. Holding the Wiimote like a steering wheel proved to be impeccably precise and responsive and really demonstrates the potential a lot of Wii titles missed out on. Turning the Wiimote to steer is a lot of fun and incredibly intuitive. At a few different points on the course you will find horizontal or vertical bars, which your Excitebot will grab onto if you drive close enough. Horizontal bars activate a quick minigame where you must move the Wiimote in a circular motion. The goal is to synchronize this motion with your racer as it spins around the bar. If you match this motion close enough, your racer spins faster, filling up a meter on the left that will boost you off of the bar when full. The vertical bars require you to thrust the Wiimote forward at the right moment, boosting you at high speed down a shortcut. If you thrust the Wiimote forward incorrectly, you will crash and lose time. Excitebots is a shining example of excellent controls. The game play itself is exciting and exhilarating at times and I found myself unable to suppress a grin on multiple occasions. The sense of speed is impressive. The huge jumps become even larger with proper application of the turbo button. If you hit it at the apex of an incline, your racer gets an extra boost bonus that catapults your Excitebot several hundred feet in to the air. If you follow that up by carefully rotating the Wiimote toward or away from the television, you can receive another speed boost if you land your Excitebot in the same orientation of the landscape. Scattered about the courses, you will find a few boxes marked with question marks. If you hit the box, it will terraform(Populous!) the track in front of you, usually raising it and making a big jump. Online play is easy to use and in over a dozen instances it never failed to connect or quickly find a match. All of the great aspects of the game shine even brighter when you are racing against human competition. Even if you cross the finish line first, you can still lose if you didn't earn as many stars as another racer. This really is a nice change of pace as it requires you to focus on bashing other Excitebots, landing sick jumps perfectly, doing midair tricks and going out of your way to complete the in course minigames. In the middle of the races you will occasionally come across soccer balls, bowling pins and several other themed objects. The objective is to score a goal or knock pins over so that you can earn extra stars. These really add to the zaniness of the game and can be a turning point in the point based online multiplayer. You can also wager stars in the lobby and earn huge bonuses if you win. This can really make collecting the more expensive items and collectibles quite a bit easier. Excitebots: Trick Racing is one of the freshest and most feature laden games I have enjoyed in the current generation. It's an amazing deal wrapped up in one of the most polished, quality titles you will find in any era of gaming.